Life After Birth: How do Mums do it? 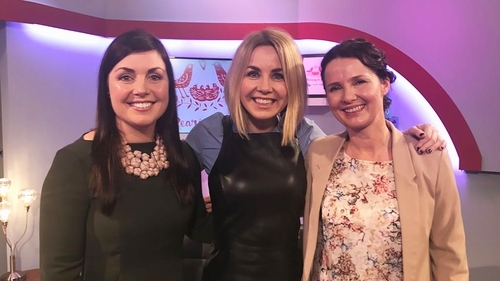 This week, RTÉ's Taragh Loughrey-Grant talks about being a parent for the first time and chats to writer Andrea Mara of OfficeMum.ie and dietitian Orla Walsh of OrlaWalshNutrition.ie. We all know it's important to stay healthy when you're a parent for the first time but how do you find the time!! As part of this week's Rearing To Go, RTÉjr's Parenting Series, dietician Orla Walsh has some practical tips for mums and dads. 1. Water yourself like a flower to avoid wilting! With even an ounce of dehydration, energy levels suffer and your ability to think will dwindle. Stay hydrated to avoid this common issue. Keep a 1 litre bottle in the fridge. Aim to drink 1 litre by lunch, and another litre by dinner! Don't worry, coffee and tea count but do have 4pm as your cut-off point for your caffeine consumption. If breast feeding, be aware that your baby will be drinking some caffeine too through your milk, so to avoid a jitterbug baby, less is more! 2. Drink milk when the baby drinks milk! Make it a healthy habit to sit down to feed your baby with a glass of milk or a drink made on milk! Milk is fantastic for you, for many reasons! - It's more hydrating than water! - There's less than 100 calories in a glass of skimmed milk, so perfect even when trying to reduce your waist line! - It provides protein and calcium which feeds our bones and teeth helping them to stay strong. - It provides iodine, an important ingredient for a healthy metabolism. - When fortified with vitamin D, it helps support immune function, bone health, and even keep muscles strong! - It provides vitamin B2, an important vitamin that needs to be provided to your body often. It helps your body cells to use the fat, protein and carbohydrates in your food to produce energy! Fruit and vegetables protect us from ill health. It's the phytocompounds (fancy word for plant nutrients!) in fruit and vegetables that give them their fantastic colour and provide us with so many health benefits. Make life easier for yourself by stocking up your freezer with frozen veg, which is wonderfully nutritious. Also, make use of the fresh vegetables that are already chopped, prepped and mixed together for you... it's fast-to-cook food, and is extremely healthy, without much effort! Protein is the ingredient at meal times that helps us feel full and stay full. Important for sleep deprived parents! Protein works it's magic by slowing down the release of food from your stomach which also provides a steady energy supply to your body. Meat, poultry, fish, eggs, pulses, tofu, soy and dairy all provide protein. When trying to keep your body healthy, aim for white proteins more often than the darker kind. Whole foods contain all the nutrition they're supposed to. By including more natural foods in your daily meals, you'll be eating in more vitamins, minerals and fibre while naturally reducing your sugar and salt intake. Aim for carbohydrates, fruits and vegetables that grew out of the ground looking similar to how they look on your plate. Generally speaking, if you can rob in from the farm or take it directly out of the sea, you're onto a winner!